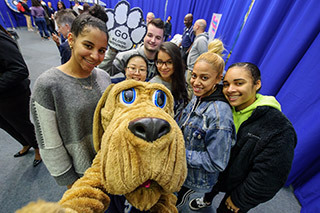 On November 28, John Jay’s Homecoming drew hundreds of John Jay students, alumni, faculty, staff, and fans to celebrate the end of an incredibly successful year for the Bloodhounds. 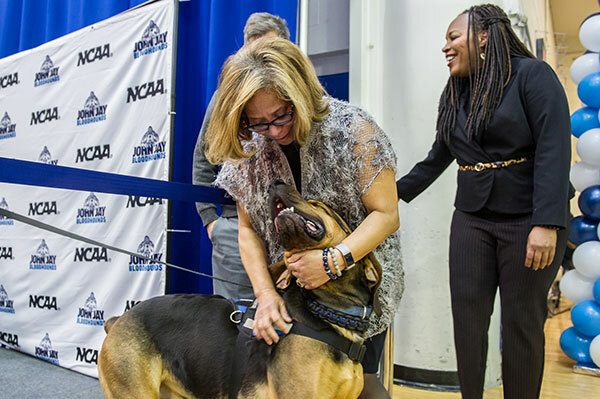 Homecoming has quickly become known on campus as one of the most fun athletic events of the year and excited fans gathered for pre-game festivities in the auxiliary gym before the first event of the evening, the women’s basketball game. 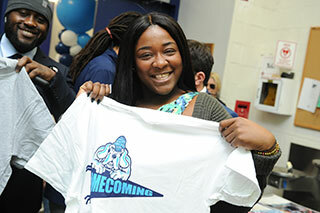 View all the photos from Homecoming here! Student athletes from the cheerleading team and rifle team were announced and honored for their 2017 successes. In March, the coed rifle team won its 12th and 13th Mid Atlantic Conference (MAC) championships in air rifle and small-bore, making it the team with the most titles in Bloodhound history. 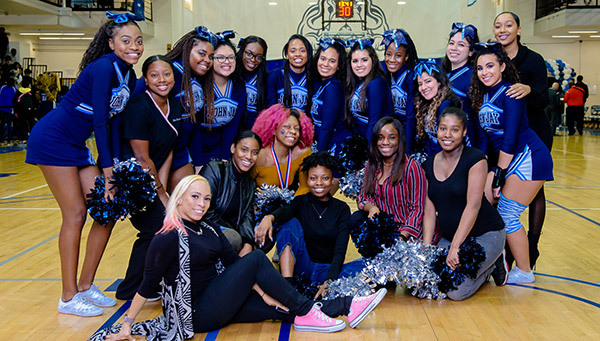 This spring, the cheerleading team also made history by winning the 2017 CUNYAC Cheerleading Champions, their first ever CUNYAC Cheer Championship. 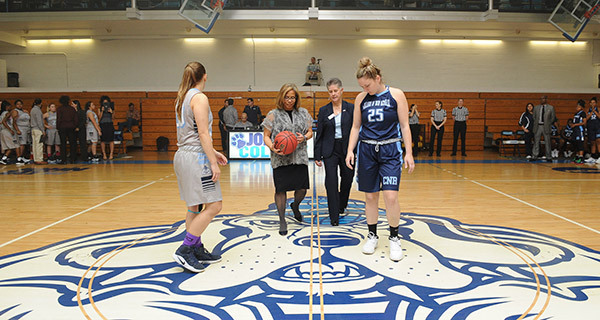 The women’s basketball game started with a ceremonial tip-off by President Karol Mason. 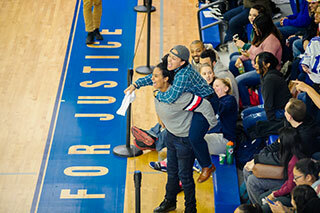 Watch the livestreamed video of the women’s basketball game here. After the women’s game, the men’s game would soon begin. But first, graduating student athletes were honored at center court. 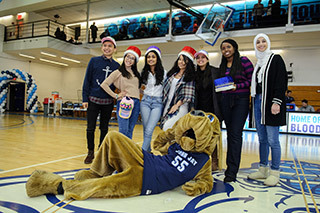 More student teams were recognized for their successes this fall, including the men’s soccer, women’s volleyball, and women’s tennis teams. John Jay’s women's tennis team won their first CUNYAC championship, marking another landmark success in the College’s history. 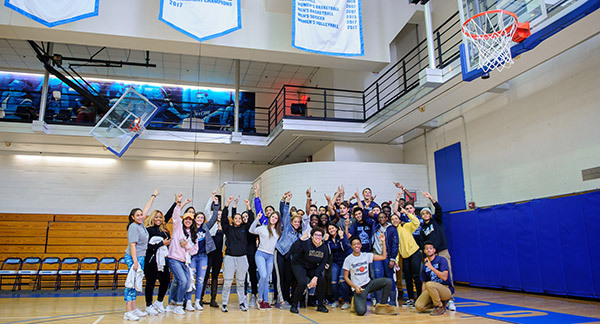 The men’s soccer team and the women’s volleyball team both made appearances in the CUNYAC Championship tournaments this year. On court, students proudly pointed to the banners that were unfurled to celebrate these victories. 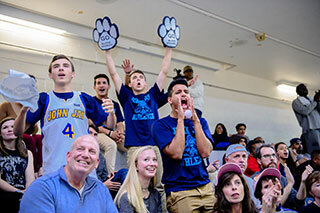 Finally, the men’s basketball game started with hundreds of eager fans cheering them on. 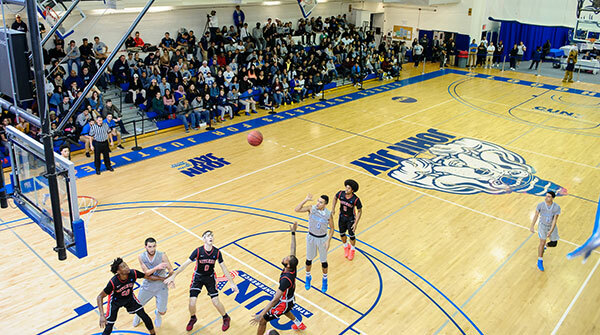 Watch the livestreamed video of the men’s basketball game here. 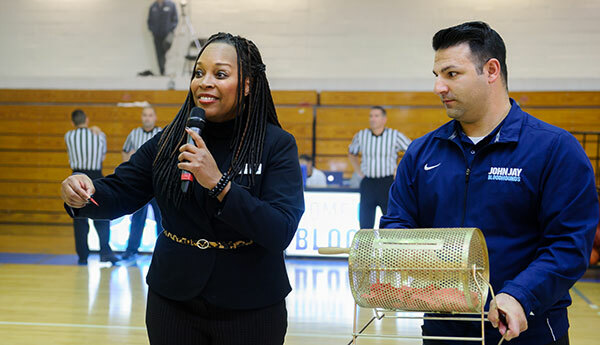 During halftime, Student Affairs Vice President Lynette Cook- Francis drew the name of one lucky student who shot from mid-court for the chance to win $10,000. 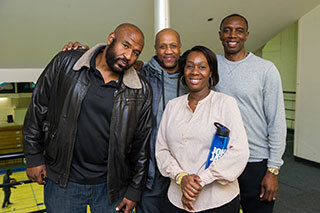 From the fifth floor sky box, alumni gathered to cheer on the Bloodhounds and celebrate the success of their alma mater’s teams. This year was particularly busy for the Athletics Department because of the number of landmark victories made by Bloodhound teams. Brandon Fieland, Assistant Athletics Director for Media Relations, said that the turnout was higher than it has been in several years. “The whole community gets involved for Homecoming,” he said. 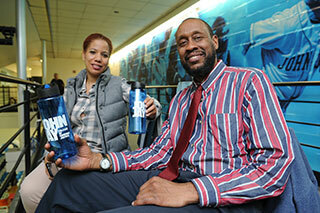 “I enjoy seeing the entire John Jay community coming together and showing their school spirit."